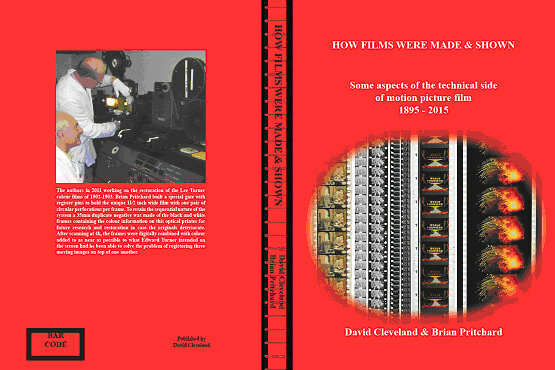 My good friend, David Cleveland and I have just published 'How Films Were Made And Shown'. It is A4 with 453 pages and 900 illustrations, many in colour. It is quite a heavy tome, 2.5 kgs. Kevin Brownlow on receiving his copy said "the book is not only unputdownable - it is heavy enough to be unpickupable!" For film archivists and those interested in the technical side of film, there are chapters on How It Worked; The Film Business Gets Going; The 1920s - Time of Change; A Quest For Colour; The 1930s and 40s; New Film, New Colour, New Sound, New Screens of the 1950s and 60s; The Film Laboratory, and Slow Fade Out covering from the 70s to 2015. If you would like further information please look at my website:http://www.brianpritchard.com/How_Films_Were_Made_and_Shown.htm. Unfortunately the weight makes it rather expensive to ship. Excellent. I'll be buying one when I get some dollars together. Oh wait. UK delivery only? Any chance I can pay for international shipment? Oh - wait again. The answer is on the website. I have done a quick check and the cost to Australia would be £60. ; I am afraid that the book is large and heavy (2.4Kgs -A4). The cost to the US is £52. The 'Buy Now' option on my website is for UK delivery only and international deliveries should be paid by Paypal directly to my email brianrpritchard@aol.com. Congrats, Brian! Looks like a great read! Thanks Brian - that price is just fine. When I get some dollars together will throw you an order. Congrats on your book. Its always a major undertaking. And its a important part of our history that generation need to know and remember. Now i know what I'll have my wife be getting me for Christmass. Thanks for the kind remarks, the sales of the book are going well. I have had an order by letter from R A Saffrey MBKS of Shenton Park in Western Australia, in order to send him his book I need a telephone number for the courier. Does anyone from Western Australia know this gentleman and have a telephone number or email address? Received my copy of this a while back. It's quite the tome! It has a wealth of information. It should be in every library. I have finally written to him; it just takes a letter a long time to get there. I am pleased to say the Academy in Hollywood has just ordered a copy for their library. Fame at last!!! Just to let you know that all copies of our book have now been sold and it is out of print. Which reminds me - it's been sitting on myself begging to be read for almost a year (sorry!). It caught my eye unexpectedly when I was visiting the BFI Southbank and was an instant buy. Although I've not dived in very deep it appears incredibly thorough. Looking forward to getting stuck into, thanks for all your efforts. What sort of run did you do? Are you printing a 2nd edition? Sell a PDF on CD? Do you have a galley proof to sell? We printed 400 copies. We are not going to print a 2nd Edition, we would have to order the same number for it to be economic and it is likely that we would get left with most of them - we are talking about £10,000 and as we published it ourselves we can't afford to risk that amount of money. We are not planning to sell PDF copies. Too bad. You obviously put in a lot of work in the book. PDF's would be the answer for preservation. Congratulations (belated) on the book! I also saw that digital reprints were available on your website for 60 pounds. This looks like such a great book!